Some 75 Cuban journalists, librarians, human rights activists and other dissidents were arrested and imprisoned during the "black spring," which started March 18, 2003. 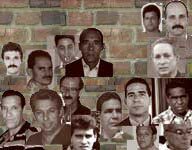 Fifty-two of them remain in Raul Castro's gulag, as of March 12, 2010. But the Group of 75 — which now stands at 52, after a series of paroles for medical and other reasons, Reinaldo Labrada Peña completing his sentence and Orlando Zapata Tamayo dying as the result of a hunger strike — is deserving of special consideration because they were at the front lines of the struggle to bring real change to Cuba, to bring nothing less than real democracy, freedom and human rights, whether they were activists gathering signatures for the Varela Project or journalists telling the story of Cuba, the real Cuba, for the world to know. The dictatorship could not stand it so, as the world focused on the imminent U.S. invasion of Iraq in the spring of 2003, Fidel Castro struck back, and struck back hard, arresting 75 dissidents and sentencing them to prison terms of up to 28 years for daring to oppose his dictatorship. And the world barely raised a whisper of protest. The United Nations subsequently elected Cuba to its Human Rights Council and the European Union repealed diplomatic sanctions implemented in response to the crackdown, even though most of those arrested remained in jail. But in the past four months, since Zapata's death, many who previously chose to ignore the Cuban human rights situation or worse, to appease the Castro dictatorship, have turned on Havana, demanding the release of the Group of 75 and other political prisoners. The Castros have been unmoved, but the pressure has been real. As horrific as Zapata's suffering was — simply put, he was murdered by the regime — his death has not been in vain. More people now know about the reality of the Castro gulag, and more importantly are now speaking out against it. We are that much closer to his fellow prisoners being free. Fidel Castro's action in 2003 was not just an attack on Cuban liberty, it was an assault of freedom everywhere. As long as a single Cuban is jailed because of something he wrote or because he believed every Cuban should have a real vote, we are all less free. To appease the tyranny in Havana and expect a change in behavior by the dictatorship is as deplorable as the crimes committed by the Castros. So that's why it is incumbent we all do something on behalf of the Group of 52. Tell someone why the embargo should remain in place. Tell someone that Raul Castro is no different than his big brother. Tell someone Oscar Biscet's story. Tell someone about Ariel Sigler Amaya, who has been left a shell of his former self after seven years in the gulag. He has been released from prison, and his spirit is strong, but his physical recovery has only begun. Tell someone about Orlando Zapata Tamayo. *Oscar Elias Biscet was arrested in December 2002, and during the "black spring" he was convicted and sentenced to 25 years in prison.